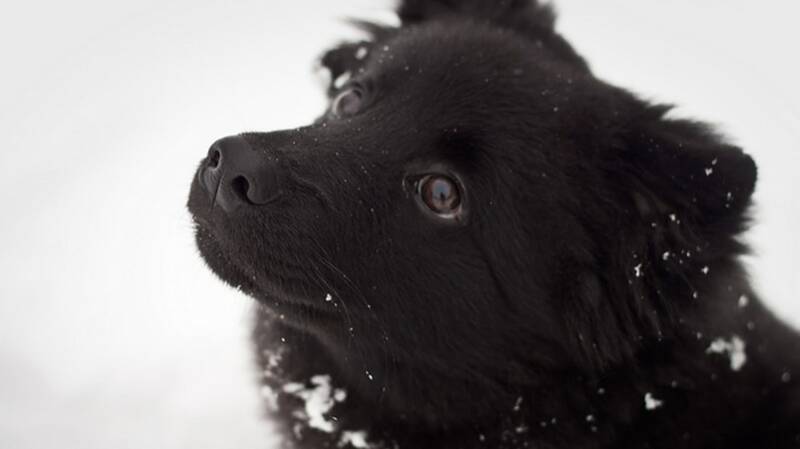 You probably haven’t heard of the rare Swedish Lapphund, but you’ll be glad to get acquainted. With pointed ears and a fox-like face, it’s hard not to fall in love. But be warned—these dogs are hard to come by. 1. THEY COME FROM NORTHERN SCANDINAVIA. Like most other breeds with geographical names, the Swedish Lapphund’s name gives some indication of its origin. Lappies come from northern Norway, Sweden, and Finland in an area called Lapland. Lapphunds are dogs that hail from that region; the Swedish Lapphund is very similar to the Finnish Lapphund, and is even considered by some to be the same breed. (The American Kennel Club disagrees with this classification, and recognizes them as two separate breeds.) Regardless, both are fluffy, fox-like herders from Lapland. 2. THEY WERE USED TO HERD REINDEER. The Sami people, indigenous to northern Scandinavia, were the first to breed Swedish Lapphunds. They used the dogs to herd reindeer, which were their primary food source. The semi-nomadic people would follow the reindeer on foot or wooden skis as the animals searched for grass to graze on. Lappies were used to corral the animals and keep them safe from harm. Today, some Sami people still herd reindeer, although the process has been thoroughly modernized. Herders are assigned specific pieces of territory at certain times of the year, and fences and ATVs have been incorporated. Lappies are still sometimes used to help with herding efforts, but they've largely been phased out in favor of Border collies and Lapponian herders. 3. THEIR BARK IS UNUSUAL. Lappies have been bred to have an unusually high-pitched bark. They achieve this noise by rapidly pushing air through their diaphragms while restricting their vocal cords. The result is a squeakier bark that’s loud, but unthreatening, which actually helps them be more effective at their jobs. The high bark lets reindeer know it’s time to move, but doesn’t scare them into thinking there's a predator around. Lapphund pups are often raised alongside reindeer calves, so the species are accustomed to working together from an early age. 4. THEY’RE PART OF THE SPITZ FAMILY. As you might have guessed from their pointy ears and furry coats, these canines are closely related to wolves. Lappies are a spitz breed, or a type of dog that has several wolf-like characteristics (such as a long snout, pointed ears, and, on some dogs, curled tails). A wide variety of other dogs fall under the spitz umbrella, including the shiba inu, the Alaskan malamute, and the Pomeranian. 5. THE BREED HAS BEEN AROUND A WHILE. Like most spitz breeds, the Swedish Lapphund has an impressive history. Scientists recently uncovered a dog skeleton resembling the Lappie, which dates back more than 7000 years. 6. THEIR DARK FUR SERVES A PURPOSE. The Lapphund's thick, furry coats means it's well-equipped to handle frigid temperatures. Its coat generally comes in two colors: black and liver. The dark coat has the added benefit of helping the dog stand out in the snow, which is, of course, pretty common in northern Scandinavia. Swedish Lapphunds are hard to come by. They’re not a registered AKC breed, although in 2009, they were granted the ability to compete in companion events. It’s believed there are only 1200 of the dogs in the world, most of which are in Sweden. Their cousin the Finnish Lapphund is significantly more popular—in 2000, the dog was the eighth most common breed in Finland. 8. … BUT ARE MAKING A COMEBACK. Today, the Swedish Lapphund is making a reappearance in the dog world thanks to its good looks and charming disposition. While it’s not likely you’ll come across one of these rare dogs in the United States, one woman did find one sitting on the side of the road in Connecticut in 1999. The rescued dog didn't know a lick of English, but did respond to Swedish commands.